Mia is going to be three years old this August 4th. I had her since she was nine weeks old. She did the obedience classes, and then when she was two she and I joined the St. John's Ambulance Therapy Dog Team. A wonderful experience, we visit a retirement home once a week, she plays ball with the elderly, they throw the ball, a couple of feet away , and she catches it and throws it back to them, the people laugh and laugh, they enjoy her visits very much. The people in the home hug her and hold her, she sits for them lays down for them, and plays shake a paw. We walk up to the building when we arrive, go in and she is greeted with someone saying " Here comes our girl." Mia loves her job and all that goes with it. What a great story - thank's so much for sharing your Mia with us. I wish you nothing but the best with her in the future. Maybe you can send us an update on how she is doing later on and lots of German Shepherd pictures of her in action. I know I'm not the only one who would love to see those. Mia is a Beautiful Shepherd! She had a Great job being a Therapy Dog and with everyone hugging her and praising her she must take it all in. I too, have a Mia who is 3 and she is Amazing and so Protective. 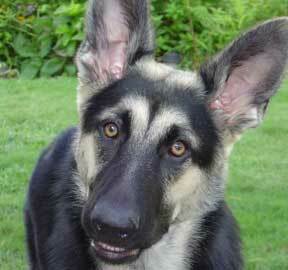 Please read our story, German Shepherd Puppy Mia Story and Mia My Beautiful German Shepherd. Take care of you Beautiful Girl, Mia and she will take care of you! Wonderful to have a dog like MIA. Keep up the excellent work.